On all rail joints wear takes place and becomes noticeable within only a few years of renewal. To keep joints level and in good condition long term it is essential to have good contact on the fishing surfaces. This is best maintained by the user of BANCE TAPERED RAIL JOINT SHIMS. “Shimming” is most economically carried out at the time of routine maintenance. For measurement purposes it is best that the track is in reasonable fettle because without ballast support a high reading may result whilst, with loose bolts, a low reading may result. Should it be decided that it is advantageous to repair the track before “shimming” to obtain accurate measurements, joints should only be raised level (not high) and a few trains should pass prior to measurement to allow the track to settle. The day before it is proposed to carry out “shimming”, one man should measure the joints noting the sizes required and, at the same time, chalking the sizes on the adjacent sleepers. At the commencement of measuring it is suggested a couple of joints should have “Shims” fitted to ensure the accuracy of the measurements being taken. 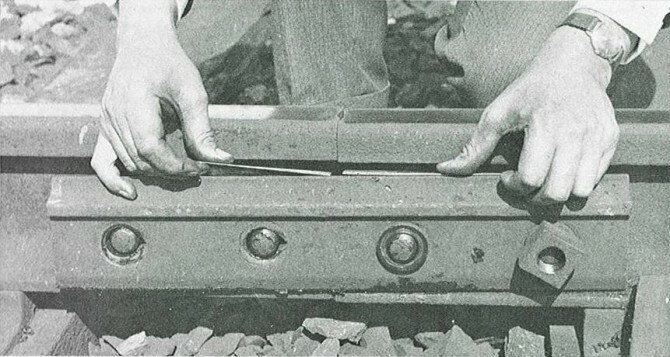 To determine the correct sizes of “Shims” a 1m (or 3ft) straight edge is placed centrally over the joint and the depression thus shown on the rail surface is measured with a Wedge Gauge positioned 18mm from the rail ends to avoid undulations. For intermediate measurements the lower size is taken. This measurement reflects the wear on the upper fishing surfaces. When the wear at adjacent rail ends differs by more than half a shim size, half shims should be used – two of one size two of another – generally the difference is not more than two sizes. The upper fishin angle should also be checked for slack and an additional allowance made. 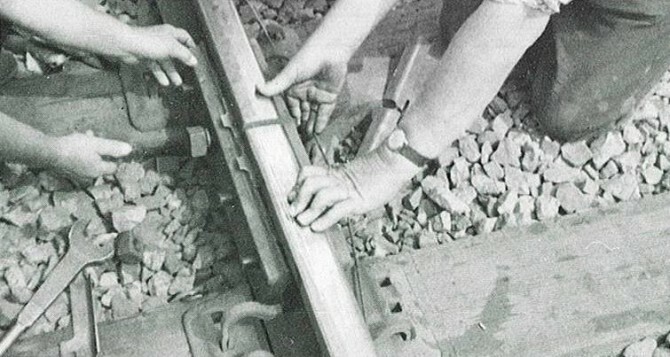 The joints must always be re-packed immediately after the installation of “Shims”, at least two sleepers either side of the joint and with large “Shims” three sleepers. It is beneficial to tighten the joints again a week or two after shimming. It is best policy to “Shim” early in the life of a joint with a small “Shim” and progressively increase the size as the joint wears. Where a larger “Shim” is to be fitted in a joint that has already been “shimmed”, the old “Shim” should always be removed. Generally one size larger should be substituted. General – Wear patters vary slightly from one track to another because of varying train speeds ballast types, axle loads, etc., therefore, shot cuts to the above procedures are not recommended. 2. Loosen joint – inspect for cracks – and fit appropriate size of shim to both sides of the joint. N.B fitting of these shims may be aided by use of magnets. N.B it may not be necessary to dismantle the joint if a full inspection is not required. 3. Reassemble joint tightening centre bolds first and check joint level is restored. 4. Repack sleepers adjacent to the joint.